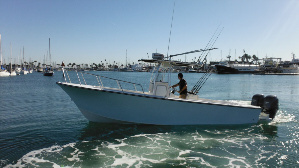 The Boat- The Fin Runner is a 2013 May-Craft 2550 center console, custom built to fish in southern California waters. 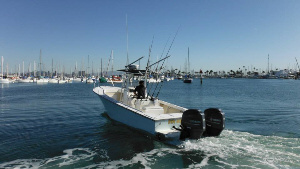 With a twin engine bracket harnessing two 2013 Yamaha 150’s (300hp), the Fin Runner stretches out to a comfortable 30’. Equipped with Ray Marine’s latest radar, sonar, navigational and telecommunications electronics, a 30 gallon live bait tank and a 300 nautical mile range; the Fin Runner will take you to the fish and back, safe and dry! 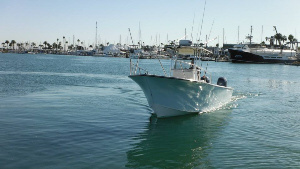 And as an experienced fisherman, I supply only the best in tackle, covering bay, near shore and offshore fishing particulars. 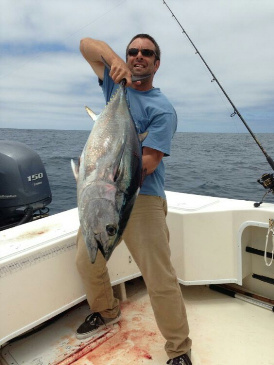 Whether it’s trolling offshore for tuna, lining up a shot on a Dorado circling a kelp patty, bass fishing in the kelp or spotting blue whales with their calves, call Brian to create fishing memories that will last you a lifetime!